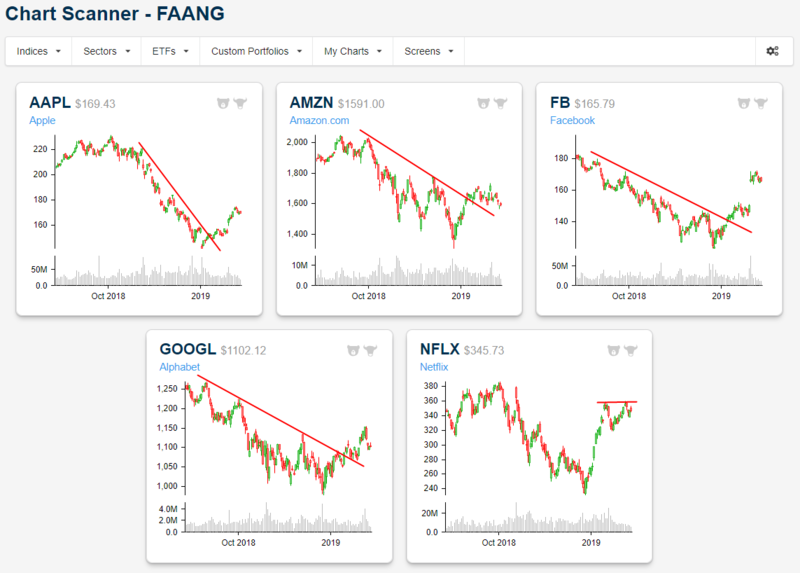 Below is an updated look at the near-term chart patterns for the five “FAANG” stocks — AAPL, AMZN, FB, GOOGL, and NFLX. All five have broken their Q4 downtrends, but none are very close to making new 52-week highs even after huge rallies off of their lows. If you’d like to see a lot of charts in one place for easy analysis, try our unique Chart Scanner tool. You can build custom portfolios and even tag charts as bullish or bearish so that you can track your calls over time. The Chart Scanner is part of our member area, which you can access with a 14-day free trial today.